Proper care of your dentures is essential to keep them in good working order and overall oral health. That’s why it’s important when damage occurs to them to get them fixed as soon as possible. Damage dentures are not only extremely uncomfortable, but can also cause other oral problems. A broken pair of dentures can lead to gum damage, infection, and more. Luckily, same day dentures in NC are easy to find and get your back in working order in no time. Having your dentures in working order is essential for good dental health and for your quality of life. Having a broken, damaged, or incorrectly fitting pair of dentures can lead to a wide variety of issues. For starters, damaged or incorrectly fitting dentures are very unformortable. Dentures are designed to fit snugly and securely, so even slight deviations can cause them to not fit right. This makes wearing them a chore, and can negatively affect your quality of life. 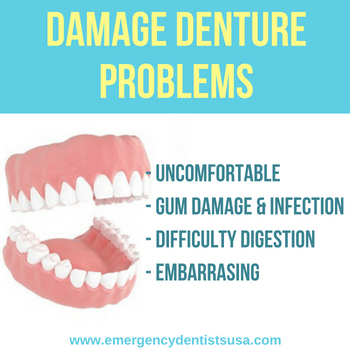 Damaged dentures can also lead to more serious gum/mouth damage and infection. A denture that rubs your mouth or has protruding pieces may damage your gums. This can lead to issues like bleeding or gingivitis. If not treated, this can also lead to serious infections which can be life threatening. Dentures, like teeth, play a big role in properly chewing food which prepares it for digestion. When your dentures are damage, this process is hampered and you may not be able to chew your food sufficiently. This can then lead to a variety of uncomfortable digestion problems. Having a damaged pair of dentures is also simply embarrassing. Having problems with your mouth can negatively affect your confidence and be embarrassing to show to others. Fortunately for those with denture issues, same day dentures in NC is quick and easy to find. Same day and emergency services are available at all times of the day all throughout the state. No matter when your dentures break, there are options in NC to get them repaired quickly. 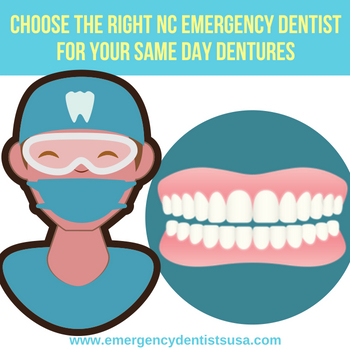 Many dental offices offer same day and emergency services, that can help you get your dentures back in working order. Many offices also offer emergency 24 hour repair for your dentures. These services are perfect for when an emergency happens after standar business hours, and when getting your dentures repaired right away is of the utmost importance. Getting your dentures repaired quickly is important, so one you notice any damage it’s essential to schedule your appointment as soon as possible. As the services a dentist offers varies, it’s important to do a bit of research to determine if denture repair is a service a particular office offers. It’s also important to understand the service level provided by a dentist. Some might not offer after hours support, while others may not be able to meet a one day turnaround. Make sure to call ahead to get the details on the service a specific dentist can provide. Before you arrive, make sure to ask which types of paperwork you should bring. Having these in order can help speed up the process. Usually, you’ll be required to bring in some form of identification, your insurance information, as well as any medical history documents you may have. If this is your first time visiting the office, try to arrive at least 10 minute early to give yourself time to fill out the pre-visit paperwork. This generally includes forms on your medical history, any allergies you might have, as well as any consent forms. This paperwork is pretty standard at any medical office you go to, and needs to be completed before the visit. It’s also important to understand your payment options as this can vary between offices. If you’re insured, most insurances will cover denture repairs, but you may be responsible for a portion of the repairs or a deductible. There may also be a holding fee, especially if you’re a new patient at the practice. This is generally a deposit that is held until your insurance payment clears, at which point it’s returned to you. All payment questions can usually be asked of the receptionist or office manager. They can answer any questions you might have, and help you come prepared to your visit. A key phrase to be on the lookout for is “same day denture repair”. Office that advertise this service are able to repair your dentures in under 24 hours, and get them back in usable condition as quickly as possible. These dentists are typically partnered with a dedicated denture repair specialist. These professionals specialize in denture repair, and are able to repair them quickly and correctly. Most damage will required one of these specialists involvement as many dental offices won’t have the correct tools for all but the most minor of damage. While most denture damage can be repaired quickly, some damage might not be doable in that time frame. For cases of extreme damage, the repair might take longer, even if the dental office advertises a 24 hour turnaround. 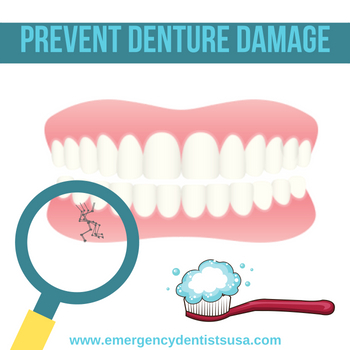 Your dentist will be able to examine your dentures, and make the determination on how serious the damage is. In certain rare cases, a new pair of dentures might be the only option. Dentures are quite fragile, and can be damaged easily. As dentures are meant to be in your mouth all day, they need to be comfortable which sacrifices durability and strength. This means it’s important to take good care of your dentures in order to keep them in working shape. As dentists are made to very precise sizes, even small amounts of damage can make them unusable. This can then lead to further damage to the dentures, or damage to your mouth as mentioned above. This can happen from denture damage, or simply from changes in your mouth. If your dentures are not fitting correctly, bring them to your dentist to examine. One of the best ways to prevent damage to your dentures is to inspect them regularly. Work this into your cleaning routine, and give them a once over daily. Catching issues early can help prevent costly fixes down the road. Lastly, always treat your dentures with care. Even a small drop can break them, or cause damage that makes them unusable. Treat them right, and they can last for years to come. Having damaged dentures is an unpleasant experience, but it doesn’t have to be one that lasts long. 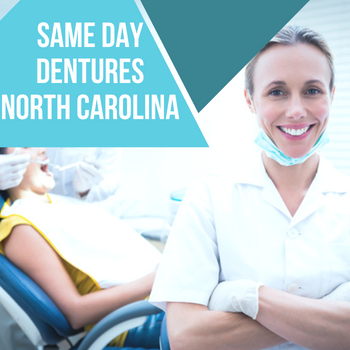 With same day dentures available in NC, getting your dentures repaired can be quick and stress free. A same day repair service can get your dentures repaired quickly, and help you get back to your life.